Whether in good times or bad, it is always worth your while to take a look at services with the potential to help increase sales in your existing carpet cleaning business. As a rug-cleaning specialist, you work with customers who tend to have valuable home furnishings. This customer is more affluent, better educated and concerned about health and safety issues. This is the perfect client profile for offering anti-allergen services. However, most homeowners are not aware that a proven system of anti-allergen cleaning is available. Researchers have long wondered whether indoor air quality plays a role in the increasing rate of asthma nationwide. About 75 million Americans have asthma or allergies to indoor bio-pollutants. Protein-related allergens are the key group of indoor bio-pollutants that act as triggers for asthma and other respiratory ailments. These proteins, in addition to mold and fungi, include allergens from dust mites (Der p 1 and Der f 1); Cockroach (Bla g 1); dog dander (Can f 1) and cat saliva (Fel d 1). Since 1980, the prevalence of asthma and asthma-related hospitalizations and deaths has increased 75 percent. It is the most common chronic disease among children. Moreover, the phenomenon is not limited to the United States. The prevalence of the respiratory disease in some countries – including Australia, New Zealand, Ireland and the United Kingdom – exceeds that in the United States. 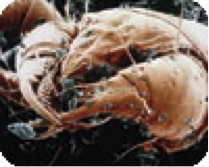 The house dust mite survives by eating dead skin cells, which comprise up to 80 percent of household dust. Dust mites also live off water vapor, which we provide for them – approximately one pint per person, per night – by perspiring and breathing. So mites are found even in climates with very low humidity. What is the Solution for Allergy Sufferers? To effectively control dust mites and other bio-pollutant allergens, the mattress needs to be regularly cleaned (about every six months for allergy sufferers). 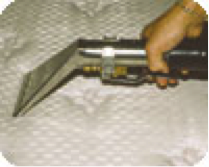 First, the mattress should be vacuumed, ideally with a truckmount so the exhaust is vented outside. If a truckmount is not available, use a HEPA-filter vacuum. After vacuuming, wet-clean the top and sides of the mattress. Don’t over-wet the fabric, as the customer will need to use the mattress that evening. 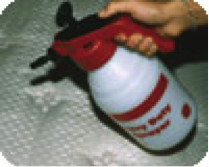 Be certain to use a product specifically for anti-allergen cleaning. The last step is the application of a non-pesticide dust mite allergen-neutralizer on the textile surface to control bio-pollutants between regular cleaning. Next, turn your attention to the carpet and upholstery. Because of chemical sensitivities, use cleaning agents that are free of perfumes, builders, hydrocarbons and solvents. New products manufactured from plant-based alcohol ethoxylates meet these criteria. Also, finish with an application of an anti-allergen neutralizing product to control the allergens between cleanings. Be certain to use anti-allergen materials that have outside test data to prove product efficacy, a lack of hazardous content, and that it can do the job of cleaning. In addition to allergy sufferers, it seems more and more of the general population is concerned with health and safety issues. Many homeowners are now asking to see the MSDS of the products to be used to clean their home. If they see hazardous materials listed, they may demand cleaning with hot water only, which of course limits your ability to remove soil and allergens. Look at the manufacturer’s MSDS to see if the product contains any hazardous materials. If you see “trade secret” claims, review the exposure controls as a sign of potential hazard level. If the company is telling you it is safe or making claims as to efficacy, ask to see the test data. You can look to third-party testing as a sign the product meets the manufacturer’s claims. One third-party testing organization is the U.S. Environmental Protection Agency’s Design for the Environment (DfE). The EPA is able to set standards without undue influence from non-governmental entities; those stakeholders may benefit financially from achieving “green” certification. The criteria used by DfE may be similar to other organizations, but the DfE is more stringent in the approval process. Your company will need to develop a unique marketing plan for allergy relief services that reflects your operation, your market and the prospective groups on which you intend to focus. Your marketing plan may be quite conservative or highly ambitious. In either case, an excellent place to begin is with your own customer base and those that contact your business for the services you currently offer. These questions elicit information and create the opening for a conversation about anti-allergen cleaning and treatment. You will need to put together a brief presentation you can use on the phone to explain these services once you receive permission. Use the brochures developed by your supplier during face-to-face presentations, which can also be used as mailings and leave-behind pieces. The key to successful marketing is to give people a reason to buy your services that differentiates you from your competition. Most importantly, this reason must be relevant to them and their needs. Referrals will be a vital part of your allergy treatment business. You will find that there are people who will call you expressing their undying gratitude for your help with their suffering. It is critically important to ask these people for referrals. It also makes sense to add allergy-relief services to your current advertising efforts. This can be added to your current advertising programs, or you can create separate communications specifically for these services, like a newsletter. It is very important when marketing allergy-relief services to avoid drastic scare tactics, as this approach has been proven to backfire. You will find a new dynamic in your cleaning business when you can do well by creating home wellness for your customers.